Being an incumbent has its privileges, but Mayor Bennett may have taken his too far. 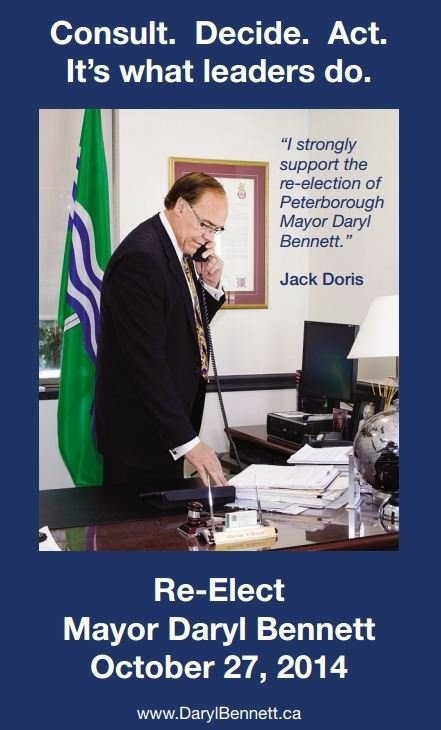 His most recent campaign photo has him in his office at City Hall. The image has been widely disseminated by his campaign, via both traditional and social media. Some might consider the photo a form of campaigning. It certainly indicates the Mayor's willingness to use his privilege, and taxpayer-funded public assets, to his advantage. However, Mayor Bennett, addressing concerns on Twitter, said that the decision to use the Mayor’s office was “carefully reviewed according to the City’s guidelines,” though as of this writing Mayor Bennett has failed to clarify who conducted the review. Was it done by his own campaign, a third party, or city staff? La politica has contacted the City to find out, and will keep you posted. At least Bennett is not claiming ignorance of the issue. After all, the City has made it clear that "Incumbents are aware of a restriction on the use of City resources for campaign purposes." Now, Ms. Monsef has a photo of herself outside of City Hall, and Bill Templeman has shot a video from the park across the street, so we assume that there is some leeway here. However, using your office as a prop would seem to be in violation – not sure how that would have passed a proper “review”. It would appear that Mayor Bennett is taking a leaf out of the playbook of Toronto’s mayor, Rob Ford, who got into hot water when he filmed a campaign video in his office. La politica supposes we’ll hear more when the dust settles. We won’t learn until 2015 how much money Mayor Bennett’s campaign was given by developers standing to benefit from the parkway extension, or how much cash he has put into this. Last time around, Bennett spent $43,193 of his own money to get himself elected, far surpassing the $12,803 put up by his opponent Paul Ayotte. Bennett also received $750 from developer Saverio Montemarano – no stranger to controversy – and another $750 from Pat Cleary of Cleary Homes. We’ll see what happens tomorrow. Sometimes you get the best mayor, no matter what. Sometimes you get the best mayor money can buy. And sometimes you just get a mayor money can buy, period. Doesn’t have to be that way. Voting’s still free.